We made a special house material run to Santa Barbara on the weekend after Thanksgiving (more about that trip in a future blog), and couldn't resist stopping in Ventura on the way back. This is one of my favorite little towns. With cute little shops and restaurants, it's super-quaint and still a little undiscovered. It's also a veritable treasure trove of thrift and antique stores. Although I haven't taken an official count, there must be easily more than 10 in the little village (main street and side streets). And the prices are exceptional. You'd be hard-pressed to find unique items at some of these prices in Los Angeles. Of course, our first stop in Ventura always involves eating (can't shop on an empty stomach). Since it was a little rainy, we ordered the coconut soup at this cute little Thai restaurant called Rice. And accompanied it with a pot of tea. We arrived just in time on Saturday as the restaurant closes for a few hours in the mid-afternoon (so the staff can eat their lunch) and then reopens for dinner. There were quite a few people who stopped in to eat (and had traveled from far distances), only to discover quite disappointedly that the kitchen was closed! The architecture of the buildings in Ventura add to the quaint old-town ambiance. Notice the nice columns here. Who knew there was a Bank of Italy in Ventura? One of the many antique stores. There is so much stuffed crammed into these stores, you have to walk very slowly to take it all in. I always find I get home decorating inspiration from shops and M. Frederic on Main St. is a perfect example. I was drawn right in by the sparkly chandelier with the white washed brick and lintel way in the back. I could live in this store. Now, here's a secret find: Called American Home and Garden, this shop is must-stop in Ventura. I'm always amazed at how less expensive many of the items are in this store (compared to shops in Los Angeles.) They also have their own blog called chateauetjardin.com or chateauetjardin.blogspot.com if you'd like to check it out. I've been thinking about getting one of these big clock faces as some art work in our main great room. And they had several nice ones at American Home. I do love stacked suitcases, especially when they are as vintage-looking as these guys. Whoever displays the items in this store does a great job. Each little consignment corner displays so many great vignettes of intriguing items. Could these suitcases make a bedside table? And wow--provide extra storage for items you don't need every day such as old photo albums. This hanging bench has me pondering where I could put it—or something like it. I'm convinced our livingroom should have a swing/couch. 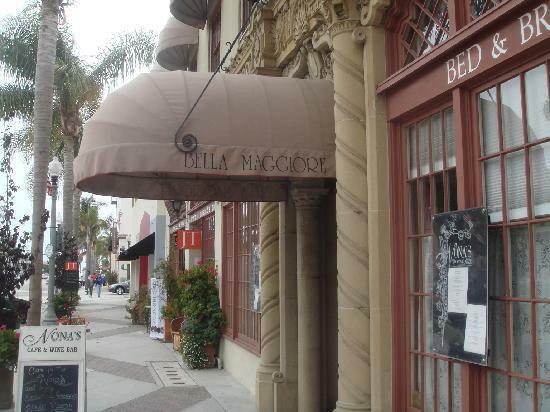 Another of our usual stops in Ventura is The Bella Maggiore Inn. They have a fabulous restaurant called Nona's Courtyard Cafe that is a lovely little secret hideaway. If my friend Susan had not told me about it many years ago, I never would have found it. I've never had a bad meal here. Some wonderful omelets and grilled veggie sandwiches. 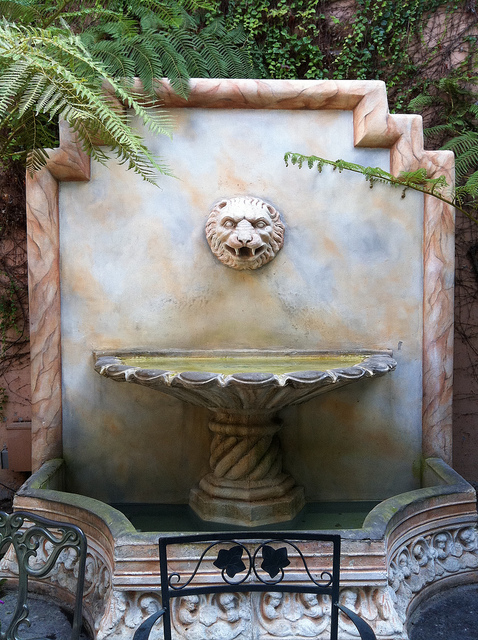 A pretty little fountain inside Nona's Courtyard cafe. The magical sound of the water cascading relaxes you as soon as you sit down at your table. My daughter has always enjoyed the freedom of playing at this fountain while we've waited for our meals. A few pennies have been wished upon here and I can say that it must be a special fountain because more than a few of those penny-tossed dreams have come true.